Thin Mint Shakeology. Nothing says winter quite like mint. It’s fresh, clean, brisk, and a great way to start the day, just like Shakeology. So naturally, the combination of the two is only logical. Some might call it peppermint Shakeology or Junior Mint Shakeology, but I prefer thin mint Shakeology since it conjures up the thoughts of those amazingly tasty Girl Scout thin mint cookies that we all love so much. The nice thing here is, while this Shakeology definitely tastes just like those cookies, it is infinitely healthier, so it’s like you’re getting a dessert indulgence for free, while actually filling your body with all the nutrients it needs for the day! Simply blend the ingredients together in a powerful blender until completely smooth. Believe me, you’ll thank me later. This is my very favorite Shakeology recipe, I never get tired of it! So next time you’re craving some Girl Scout cookies, try this recipe instead. You’ll end up with the same satisfaction, but your body will thank you! You can always just donate some money to the Girl Scout cause instead! 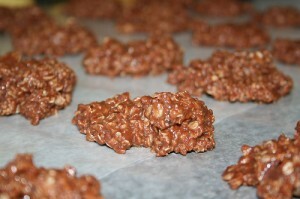 Shakeology No-Bake Cookies, or Shakeology Balls, meet my old favorite! Every holiday season growing up, my mom would make many different holiday treats, such as fantasy fudge, Martha Washingtons (my dad’s favorite, a kind of coconut nougat ball dipped in hardening chocolate), and my absolute favorite that simply went by John’s Chocolate Candy. When we moved to Dallas, after having lived for 27 years believing this recipe was made just for me, I discovered some rather similar treats in the local grocery store, and soon heard the term “no-bake cookies” used by everyone to refer to them. I was crushed! No longer did I have my very own special treat! No longer was the goodness mine to enjoy alone! Then a fellow Beachbody coach jumped into the party and created a Shakeology No-Bake Cookies recipe. I tried it, it wasn’t bad, but it certainly wasn’t my traditional John’s Chocolate Candy. So I went back and looked at my mom’s recipe. Aha!! Her recipe involved baking!! Reprieved!! Once again my treat is special! Once again I have something unique to share! First, remove any rings you’re wearing and wash your hands really well. Then combine ingredients in medium bowl. Mix well. Roll into balls (about a heaping teaspoon each). Optional: Roll in crushed nuts, oatmeal mixed with a little cinnamon, whole-grain graham cracker crumbs, or unsweetened coconut flakes. Roll into balls (about a heaping teaspoon each). Optional: Roll in crushed nuts, oatmeal mixed with a little cinnamon, whole-grain graham cracker crumbs, or unsweetened coconut flakes. For preparation, I make this your assignment. Try both ways. Try bringing the honey/agave, milk, and Shakeology to a rolling boil (yes, Shakeology is healthiest when not cooked, but it’s still far healthier than the alternative no matter how it’s served), and then adding the other ingredients and rolling into balls and chilling for later. You can also try simply making the balls without the baking and see how it goes! Please try this recipe out, comment below and let me know what works best for you, and we’ll work together to figure out the ultimate recipe! You can also try simply making the balls without the baking and see how it goes!